Will I Get My Asking Price When Selling My Home? Last week, we went through how days you may need to wait until your home sells. How long until my home in Reno sells? I’m following up with how close the offers will be to asking price. The major factor is asking price compared to market value and then testing sold price vs asking price but the only way to do that is run a comparable report on every sold property in the MLS or using an algorithm. I don’t have the time or wherewithal to comp a couple thousand houses and we all know how well Zillow.com algorithms work (there will be a post on this) so I’m sticking with the data we have. The average sale to list price was 98.16%. As normal, anything from $150,000-$200,000 is going real close to list price but what surprised me was the $500,000-$1,000,000 staying close to that too. 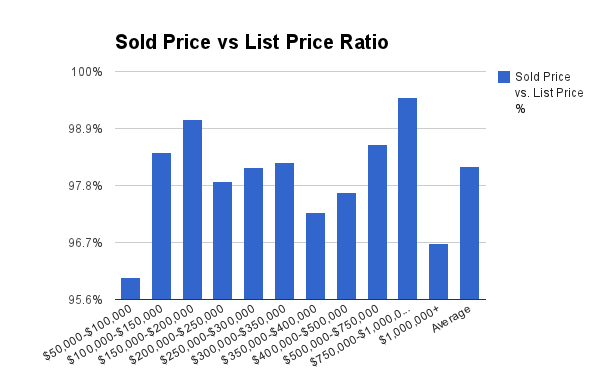 Remember, the data in the image are still averages so there some properties that are selling at or above asking price. Either way, the market isn’t as hot as 2013 when averages were at or above asking prices. To get your home value visit www.HomeValuesOfReno.com or email your address to Ricky@RickyBeach.com. Posted in For Sellers, Market Update, News and tagged prepare home for sale reno, reno comps for houses, reno home values calculator, reno listing price to sell, reno listing prices reduced.